This morning, Apple rolled out a a bunch of products during their press conference at their headquarters in Cupertino, CA. These new items included newly designed iMac and iWork/iLife 2008. Apple’s sleeker and aluminum-enclosed iMac now sports Intel’s latest Core 2 Duo Extreme Processors, which support running up to speeds of 2.8GHz. The machine is a powerhouse as it has room for up to 4GB of RAM and 1 Terabyte (TB) of internal storage! 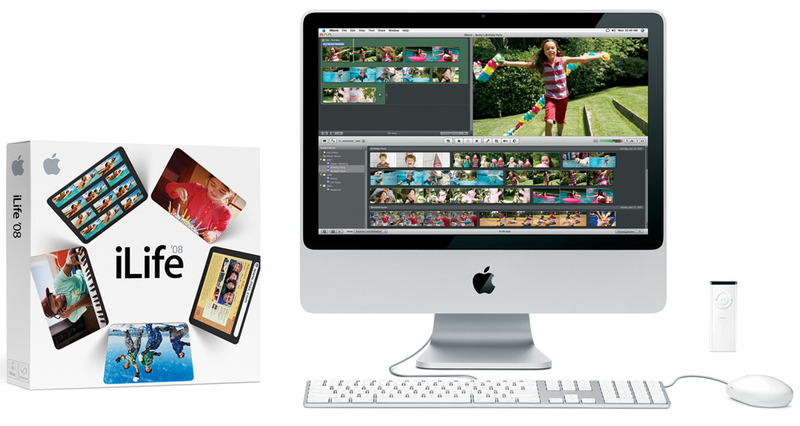 With a fast processor, enough RAM, and storage space, the 265MB ATI Radeon HD 2600 PRO makes the iMac perfect for video editing. In addition the iMac now comes standard with a built-in iSight, Bluetooth 2.0, 8x Dual Layer DVD/CD Burner, AirPort 802.11n (+ a/b/g), Gigabit Ethernet, FireWire 400 & 800 ports, 3 USB ports, Stereo Speakers and a Microphone. 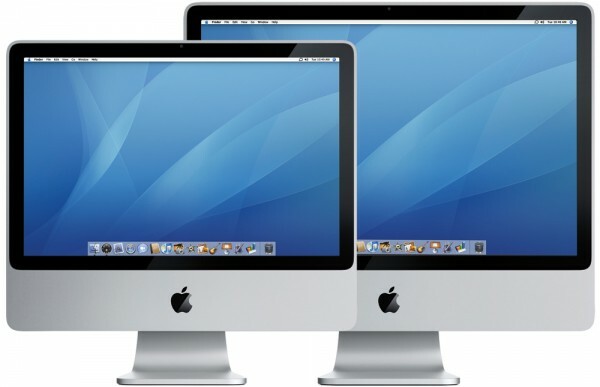 Although Mac OS X Leopard won’t be available until this October, it will still be able to run both iLife and iWork 2008. The new iMac is available with a 20-inch or a 24-inch display. Pricing for the 20-inch starts at $1,199 while the 24-inch begins at a whopping $1,799. The iMac can also become truly cable-free if you spend an extra $50 to replace the wired mouse and keyboard with Apple’s Mighty Mouse and new Wireless Keyboard, which connect to the computer’s internal Bluetooth receiver. In addition the ultra-thin aluminum keyboard includes special function keys such as brightness/volume control, disk eject, iTunes play/pause, ExposÃ©, and more! As iLife has been one of Apple’s strongest selling point for the Mac OS X, it was only appropriate that they released the 2008 edition just in time for the launch of Leopard in October. This upgrade brings a ton of new features to iPhoto and in fact completely redesigns iMovie. The main feature Steve Jobs touched on during his press conference was iPhoto’s ability to automatically organize libraries of photos into events based off time stamps. Events can be split into multiple events and separate ones can be merge back together and named accordingly. With this new feature users may now search for a event’s name and find a neat set of photo instead of having to search through filenames directly. Once photos are rated using the new star rating system, users can hide photos that they don’t like, but do not want to delete. (Just like the system in iTunes) And as for iMovie, the application now supports importing video from just about any HD camcorder in addition to DV and clips from Digital Cameras. With the new faster and more efficient interface, users can quickly skim through clips, preview the movie, drag/drop to re-organize clips, add tracks from iTunes, create voice overs, and use the new effects. The exporting function has been improved to support the iPod, iPhone, Apple TV, and YouTube formats in addition CD/DVD. And as a bonus for .Mac subscribers, iLife 08 will support easy uploading to share Photos and Videos with both Mac and Windows users. iLife also includes an updated iWeb with new interactive Widgets and an updated GarageBand. iLife is now available online and in stores for a retail price of $79. And the final announcement was the new iWork 2008, which includes a new innovative spreadsheet application called Numbers and upgraded versions of Keynote and Pages. Numbers features a new concept called Intelligent Tables, which is supposedly revolutionary, while Keynote got new effects/transitions/animations and Pages got a word processing and a page layout mode. iWork 08 also retails for a price of $79 and is also available online and in stores now!